This guide helps lighting designers with the creative and operational challenges they face in their rapidly evolving industry. 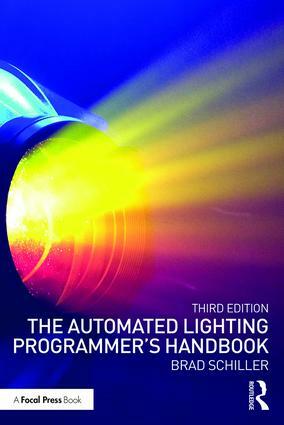 Providing respected and clear coverage of the process of programming automated lighting fixtures, the author brings the designer from basic principles to preproduction preparations. Concepts, procedures, and guidelines to ensure a successful production are covered as well as troubleshooting, much needed information on work relationships, and technology including LED lighting, console networking, digital lighting, and more. Chapters are peppered with advice and war stories from some of the most prominent lighting designers of today. Brad Schiller has nearly 30 years of experience in the lighting industry. He has worked as a Technical Director and Lighting Designer as well as an Automated Lighting Programmer. He has been employed by leading manufacturers including High End Systems, Vari-Lite, and Martin where he has assisted with product development, training, and testing for many popular fixtures and consoles. Brad has experience with various types of productions including theatre, television, concerts, film, architectural, dance, and corporate events. Project favorites include: the 1996 Academy Awards, The Sydney 2000 Olympic Games Opening and Closing Ceremonies, The Crystal Method, and Metallica. Brad is also a featured columnist for Project Lights and Staging News (PLSN). His monthly column titled "Feeding the Machines" teaches programming principles in a simple and straightforward manner. Furthermore he has written for other industry publications and authored several industry manuals. Brad was presented with the Technician of the Year award at the 2005 LDI awards ceremony and described as "the programmer’s programmer".